Hell Yeah! 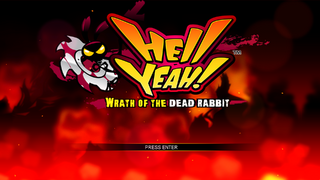 Wrath of the Dead Rabbit, called Jigoku Dai Suki Hell Yeah! (地獄だい好き Hell Yeah!) in Japan, is a platform game developed by Arkedo Studio for Steam, PlayStation Network and Xbox Live Arcade. Main article: Hell Yeah! Wrath of the Dead Rabbit/Achievements. Main article: Hell Yeah! Wrath of the Dead Rabbit/Changelog. Includes 58 new masks and 11 skins, many of which are based on Sega characters. Includes a new Virtual Reality level, which 50 missions to complete on it. Theme for PlayStation 3 system menus. PlayStation Plus subscribers only. Main article: Hell Yeah! Wrath of the Dead Rabbit/Magazine articles.